In APx, this process requires characterizing the system response using a measurement microphone and a measurement such as Frequency Response or Acoustic Response. The measured response curve is exported, and then imported into the Output EQ and inverted in order to achieve a leveled acoustic output. This is best performed in the Acoustic output and Acoustic input configurations, normalizing the level with Auto Gen Level before the characterization sweep, and again after the Output EQ is applied. When performing tests on acoustic devices, APx500 can be set to use the Acoustic input configuration. 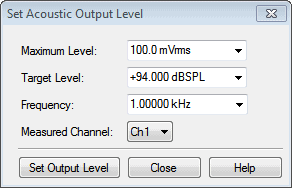 This setting configures all APx500 measurements in the signal path to display levels relative to channel-specific acoustic reference units, and is useful for making acoustic measurements with multiple microphones. Level results are reported in decibels of sound pressure level (dBSPL) or pascals (Pa). For level, the values are rms. Gain results are reported in Pa.
Instantaneous voltages are reported in Pa. Impulse response is reported in Pa (in this case the Pa values are instantaneous). The Pa and dBSPL values use the Sensitivity input reference(s), set in the Set dBSPL Per-channel / Microphone Calibration dialog, and also displayed in the References dialog. In Signal Path Setup, set the Acoustic checkbox. 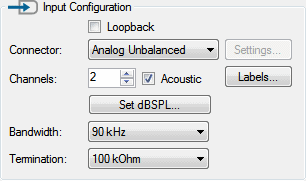 Acoustic input configuration and the Acoustic checkbox are only available for analog inputs. Similar to Acoustic Input configuration, APx500 can be set to Acoustic Output configuration. Acoustic Output configures all generator level setting fields and generator level graph displays to appropriate units of pascals or dBSPL. An acoustic signal path has a scaling factor called Voltage Ratio associated with it, expressed in Pa/V. The Voltage Ratio is determined in the Set Acoustic Output Level dialog, discussed below. Acoustic output configuration and the Acoustic output checkbox are only available for analog outputs. When in Acoustic output configuration, the Auto Gen Level button is available in Signal Path Setup: Output Configuration. In Signal Path Setup, place a check in the Acoustic checkbox in Signal Path Setup: Output Configuration. When the Acoustic checkbox is set in Output Configuration, you are prompted by APx500 to use the Auto Gen Level feature to establish a relation between the generator voltage being used to drive a source (amplifier and loudspeaker) and the acoustic level measured by the microphone. Place the test loudspeaker in whatever space or acoustic chamber will be used for test. Calibrate your microphone with a standard calibrator. In the Set Acoustic Output Level dialog, set Maximum Level to a point that will prevent damage or excessive non-linearity in the amplifier / loudspeaker system. Set Target Level to match a reasonable level for the amplifier / loudspeaker system. Note: It is often a good idea to use the same level as the microphone calibrator, provided that the amplifier / loudspeaker system is capable of delivering that level. Set Measured Channel to match the channel receiving the microphone signal. Set Frequency to drive a loudspeaker with a signal for which behavior is well defined (e.g., 250 Hz or 1 kHz). Click “Set Output Level” and Auto Gen Level will regulate the generator to attain the target acoustic level. APx will record this relationship (called the Voltage Ratio) as a reference. Note: You can see the calculated Voltage Ratio by selecting any Reference Level measurement in the Project, then choosing “More References”. Now acoustic measurements made with this project will reflect actual acoustic units (e.g., dBSPL or pascals) in the test environment. APx provides two means of creating output with a non-flat response: Output EQ and Generator EQ. Output EQ may be applied to any signal produced by up to two analog outputs of APx, while Generator EQ specifically affects the frequency response of the APx generator itself for certain measurements, for both analog and digital outputs. Output EQ allows equalization to be applied to any arbitrary signal, which makes it particularly useful when testing stimuli such as speech samples or noise. In order to avoid overload and clipping due to settings of Output EQ, the filter is designed to only reduce signal level, with a maximum gain of –1 dB. The filter is applied to all audio signals, including sine wave, square wave, sweeps, IMD signals, multitone, noise and any non-coded arbitrary generator waveform signal output from files on disc, including POLQA and PESQ stimuli. The filter cannot be applied to the square wave and DIM signals generated in the AG52 option. Once the Signal Path Setup has been calibrated for Acoustic Output, capture a frequency response measurement of the loudspeaker in the space or chamber being used. Export the Relative Level result data as a CSV or Excel file. Output EQ FileOpen the EQ menu in Signal Path Setup: Output Configuration. Choose “Browse for File”. Browse to the file from step 2 and import this data into Output EQ. The Output EQ table dialog will appear automatically. Invert the captured curve using the Invert function in the Output EQ table dialog and save results. APx500 will use this measured curve to create a 30-pole approximation of the desired, leveled output. Once APx creates an EQ curve that will be applied to subsequent measurements, this curve may result in a level shift from the reference established earlier using Auto Gen Level. This occurs due to the -1 dB maximum gain of the Output EQ. Re-run the procedure described above in Setting Levels. Auto Gen Level will recalibrate the loudspeaker with the Output EQ applied. This assures that all results will match real acoustic levels in the test chamber. This entry was posted in Measurements, Technical Library and tagged APx515, APx52x, APx52x Series, APx555, APx58x, APx58x Series by Sean. Bookmark the permalink.